During the four weeks of giveaways, I posed the question, “What is your favorite Christmas cookie?” Classic sugar cookies were definitely the number one answer, but coming right behind behind were gingersnaps and snickerdoodles… two of my favorites! 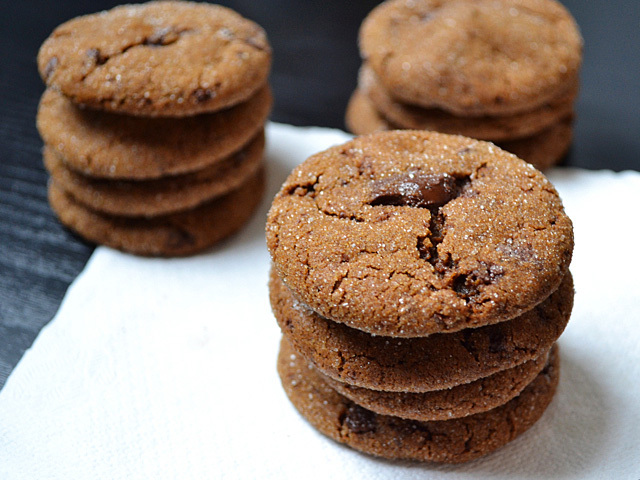 But these Chocolate Gingersnaps have to be my ultimate favorite. 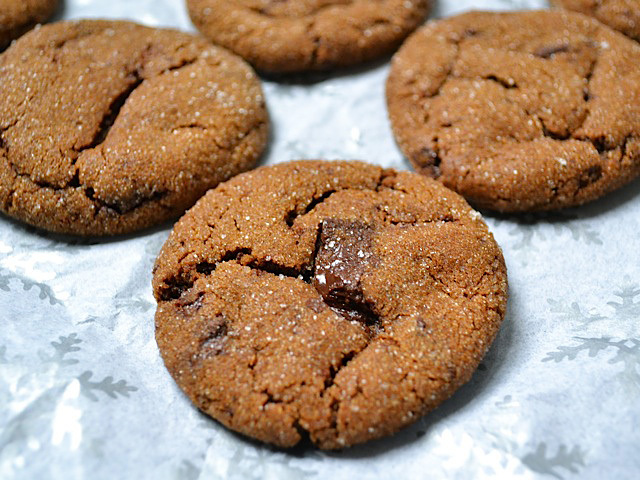 I’m not a huge sweets person, which is why I like these chocolate gingersnaps. The semi-sweet chocolate and spicy ginger, nutmeg, and cloves help counteract that sugary sweetness. These cookies have a real BITE! They’re not the most inexpensive cookie (you can’t beat a regular sugar cookie there), but since they’re my favorite I decided to share them. My mom first introduced me to these Chocolate Gingersnaps and I fell in love. I’m not sure where she got the recipe, but it’s important to note that it’s not my recipe. I don’t know where they originated, but I’m just passing them along because they’re too good to keep to myself! 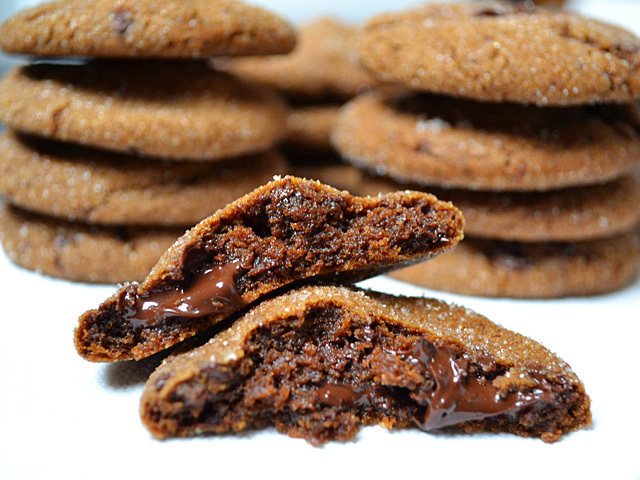 Chocolate gingersnaps are a sweet and slightly spicy cookie with big chunks of melty chocolate inside. Perfect for those who like sweet and savory together. 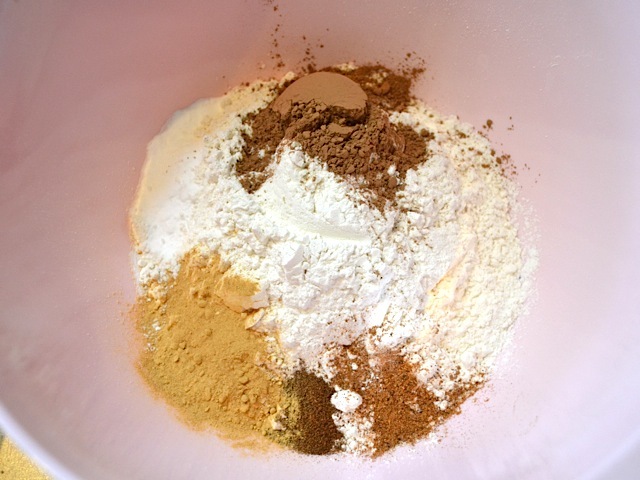 In a medium bowl, whisk together the dry ingredients: flour, ground ginger, cloves, nutmeg, cocoa powder, and baking soda. Peel the fresh ginger and grate it into a separate, medium-sized bowl (grate using a small holed cheese grater). 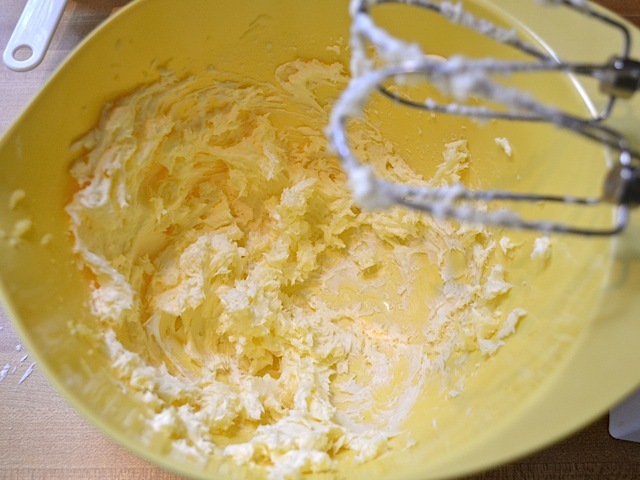 Add the butter (room temperature) and beat with an electric mixer until it’s light and fluffy. Add the brown sugar to the butter mixture and beat again until fluffy. Add the molasses and beat until fluffy. Add half of the flour mixture and beat until well incorporated. Add the second half of the flour mixture and beat until fully incorporated. 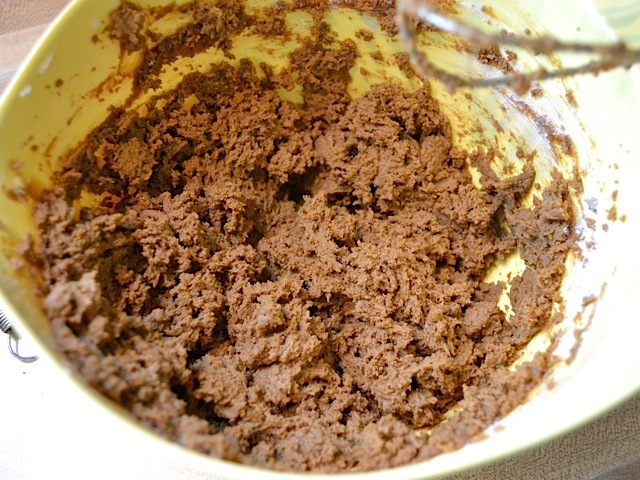 If the dough is too dry and won’t come completely together, add one tablespoon of water. 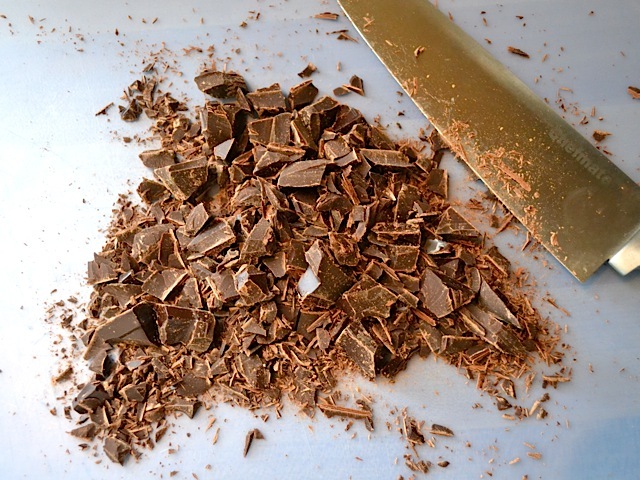 Roughly chop the semi-sweet chocolate into small pieces. Stir it into the dough. Transfer the dough to a sheet of plastic wrap. Wrap it tightly and refrigerate for about one hour or until firm. Preheat the oven to 325 degrees. Place the white sugar in a small bowl. Take the dough out of the refrigerator and divide it into 24 pieces. 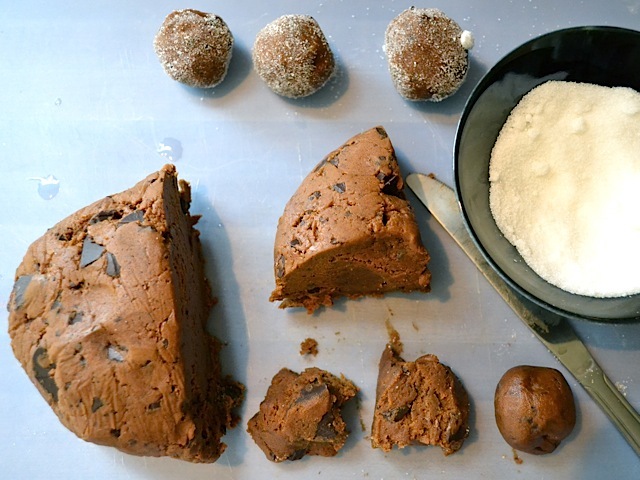 Working quickly, roll each piece of dough into a ball and coat it in white sugar. Place the sugar coated dough balls on a baking sheet covered with parchment (12 per baking sheet). Bake in the oven for 10-12 minutes or until the surface looks cracked. Start by whisking together (or sifting together) the dry ingredients: flour, ground ginger, cloves, nutmeg, cocoa powder, and baking soda. Place the room temperature butter in a separate bowl. 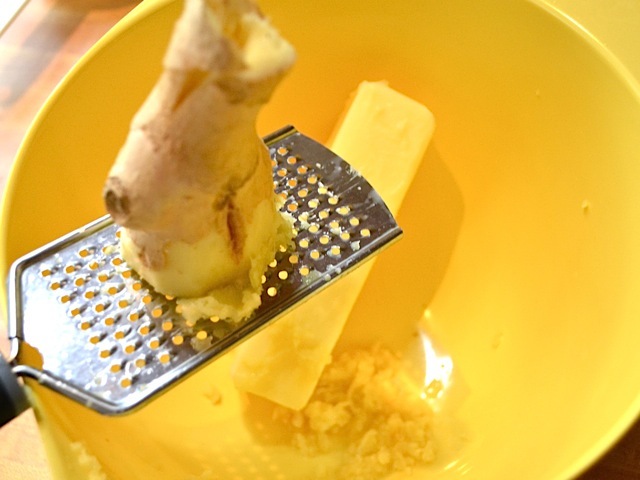 Peel and grate the ginger into the bowl with the butter. The more ginger you use, the spicier the cookies will be. 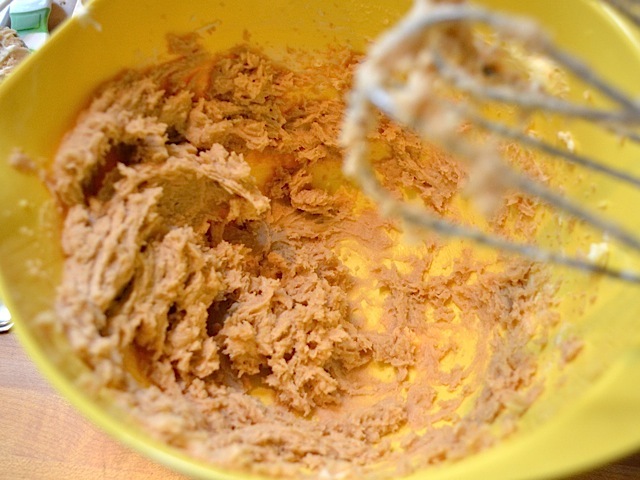 Beat the butter and ginger together until it is light in color and slightly fluffy looking. Add the brown sugar and beat again. Add the molasses and beat again (I only beat the mixture for about a minute after adding each ingredient). Add half of the flour mixture and beat until it is well incorporated. Add the second half and beat again. Remember to begin your mixer on a low speed when adding flour or else it will end up all over your kitchen! The dough should still be fairly sticky at this point. If it’s too dry to come together (and look like this), try beating in one tablespoon of water. Now it’s time to add the chocolate chunks. Mine came wrapped in one ounce squares. 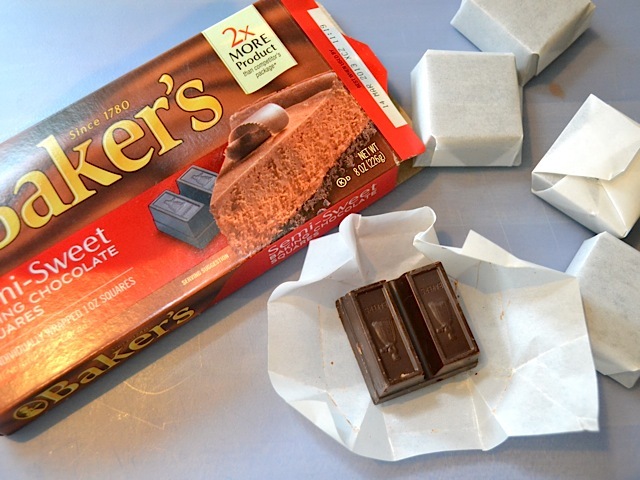 You can use your favorite semi-sweet chocolate. 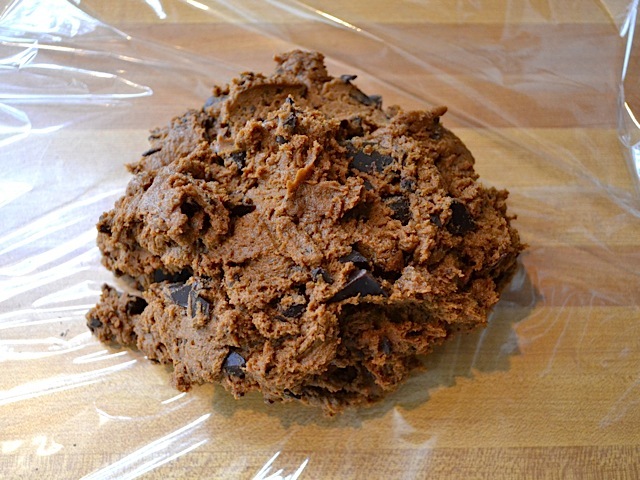 Stir the chocolate chunks into the dough. Wrap the dough up in plastic wrap and refrigerate for about an hour. The dough is too sticky to shape into balls when it is room temperature, so it needs to firm up in the refrigerator. Once the dough has firmed up in the refrigerator, unwrap it and cut it into 24 pieces. It didn’t seem like I’d get 24 pieces out of that small ball of dough, but I did. I first divided it into quarters and then cut each quarter into 6 small balls. As the dough warms up it will get sticky, so work fast. 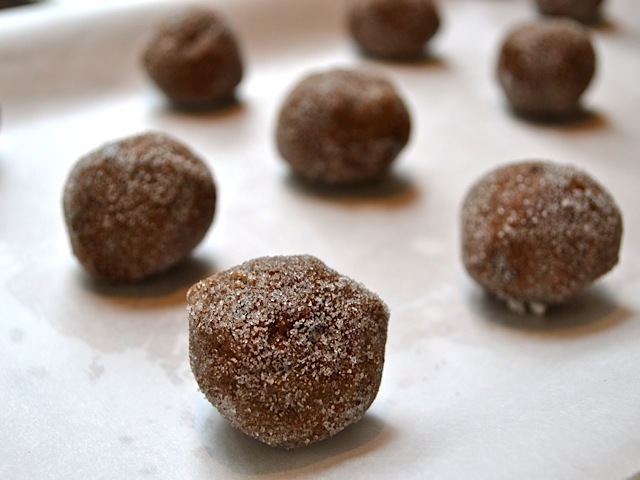 Roll each ball in the white sugar. Cover two baking sheets with parchment paper and place 12 dough balls per baking sheet. Bake one sheet at a time in a preheated 325 degree oven for 10-12 minutes. 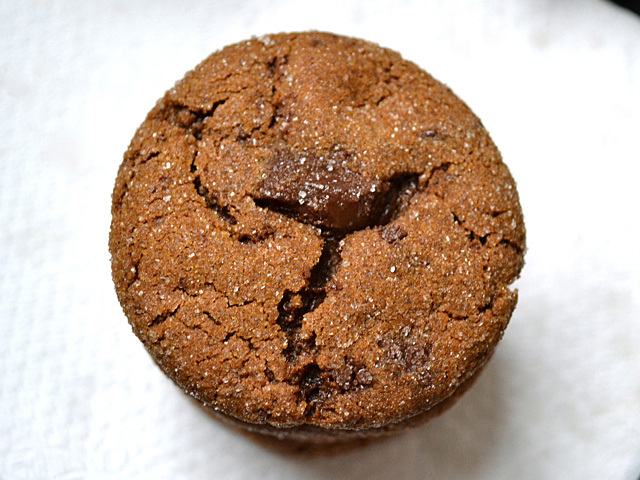 You’ll know the Chocolate Gingersnaps are done when the tops begin to crack open. They’re so good with their spicy bite and chunks of semi-sweet chocolate! I made these last night and they spread and flattened a lot. I don’t think it’s the recipe’s fault, though, because this seems to happen to me with all drop cookies that are based on creaming together butter and sugar. Does anyone have any advice on why this happens? Am I not beating the butter and sugar long enough or for too long? I have a kitchen aid stand mixer – the lower-end version – and I use the paddle attachment. The butter/sugar mixture gets stuck up the sides of the bowl, and I do scrape the sides occasionally, but I wonder if it doesn’t get mixed enough. Anyway, thanks for any ideas! Flat cookies are always so disappointing. These were good, but they just don’t beat the “big soft ginger cookies” that I usually make. I’m finding (as I JUST made them) there’s a bit too much of a molasses presence in the flavour. I wonder if it’s the brown sugar? With the ginger cookies I make, it’s just white sugar. I think the molasses flavor coming from the brown sugar is probably negligible compared to the 1/2 cup of molasses used in the batter. If you wanted to cut down on the molasses flavor I’d just cut back on the molasses. :) I made these once and didn’t have the full 1/2 cup molasses (I had about 1/4 cup) and they still turned out great! I had to add a couple extra Tbsp of water to make the dough come together, but the cookies’ texture was still fine and a much lighter molasses flavor. I love this recipe! It’s really admirable that you are so diligent about crediting your recipes, even if you’re not sure of the original source. I think I can help you out there–this looks really close to one of my favorites, Martha Stewart’s Chewy Chocolate Gingerbread Cookies: http://www.marthastewart.com/339353/chewy-chocolate-gingerbread-cookies. Your recipe replaces the white sugar with more molasses though. 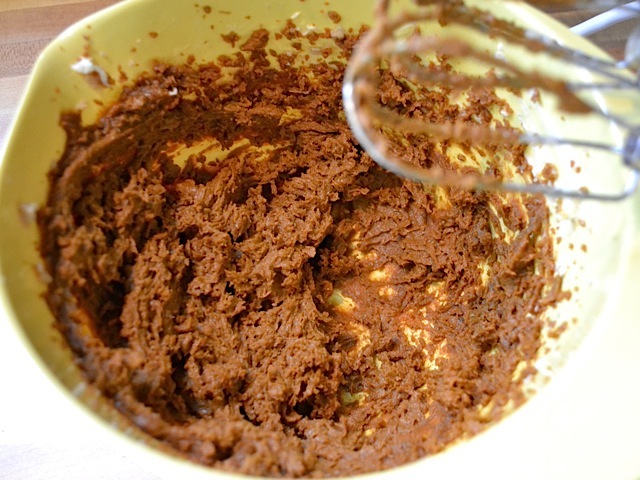 The last time we made it, we doubled the cocoa powder, ginger and spices. So good! I’m getting super excited now because I’ll probably make a batch this weekend. I’ll be making my first trip to the new Trader Joe’s in NOLA tomorrow–I once used one of their giant bars of chocolate for a huge batch these, and it came out really good. If I recall correctly, it was around $5 for a 16 oz bar of quite delicious chocolate. Hopefully they’re still that cheap, in which case these cookies are for SURE happening! I made these this evening exactly as described and they turned out perfectly! 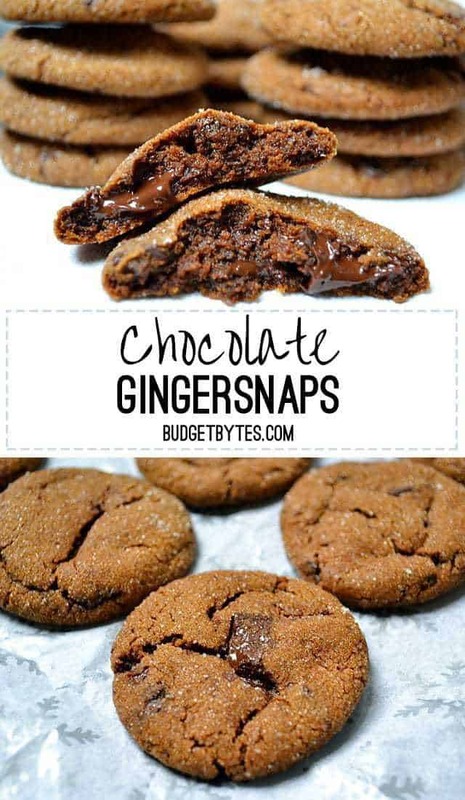 I really loved the addition of chocolate to a gingersnap – I never would have come up with the combination on my own, but they fit together great. I tried out my new Silpat for the first time with this recipe and the cookie texture was phenomenal: crisp and cracked on the outside and soft and chewy on the inside. These cookies are amazing. The first batch spread a lot, I guess because they were warm. The second lot I did from frozen, and they held their shape better and still cooked in 12-13 minutes. I gave most away, so I’ll be making another batch soon! just finished making these for a holiday party tonight, and i have to say – they are fabulous!! thanks for the recipe! Oh my. This is definitely on my to-do list.